As Barry closes in on the Babe and Hank, Topps will be there every step of the way, as it has been since the release of his rookie card in 1986. Now, collectors can join Topps as it chronicles history in the making. 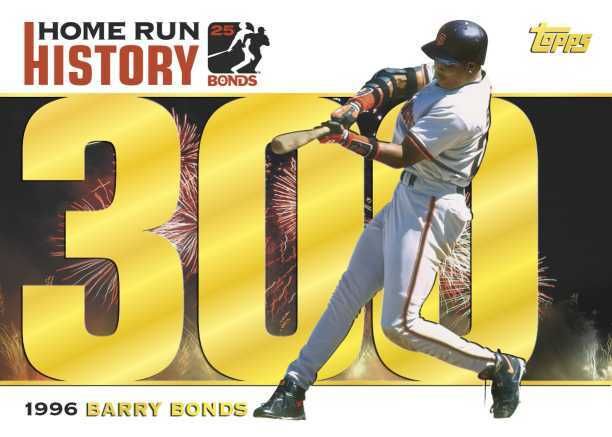 Beginning with the just-released 2005 Topps Series 2, Topps celebrates Barry Bonds' historic career and home run chase by commemorating each and every one of his blasts in a unique set called "Home Run History". It's the ultimate Bonds collection! In Series 2, collectors will be able to find cards for home runs 1-330 inserted 1:4 packs, with each card featuring specifics of that particular home run on the back. The series will continue in 2005 Topps Traded & Rookies, where collectors will be able to find home run cards 331-660. The set will be caught up to date with the release of 2006 Topps Series 1, which will feature home run cards 660-? And next month, Topps will launch "The Barry Bonds Trading Floor", a special website dedicated exclusively to collectors who wish to trade cards from this special Barry Bonds set. Stay tuned!